Let's take a look at how the Adobe Creative Cloud can help you be more efficient and organized on your motion design projects. While you may be a 'cloud-storage' lover, the industry shift from completely local storage to web based syncing is relatively new. So unless you came into the Adobe fold recently, you may have been shying way from using the organizational power of the cloud for your creative projects. For a good while now the reliable standard workflow for asset management has been based completely on local storage (hard drives, servers, etc. ), Ranging from project files, client data, brand standards, and footage. In a lot of ways local storage still makes sense, but for teams working on the Creative Cloud, the Library offers a beautiful layer of stress free asset management and it's free if you have a Creative Cloud Subscription, which if you're reading this article, you probably do... Let’s go over the options offered in this integration. What is the Adobe Creative Cloud Library? Physical based storage is great, but one notable feature that sets cloud storage apart is the ability to invite collaborators, this is where the Creative Cloud Library comes into play. The Adobe Creative Cloud Library is an online storage solution that allows teams to sync and share projects, assets, and files seamlessly through the Creative Cloud. Essentially this allows you to have a centralized location for project assets. Think about it - you never have to pass around branding colors and client logos on a thumb drive in the office. You have one spot with all the info, and if someone is lost you just send them a file path. How Do I Access the Creative Cloud Library? If you’re used to used the Dropbox desktop app then this should feel fairly familiar. The Creative Cloud Library works in a similar way, but with more integrations into your creative apps. When you first ever open After Effects the default workspace actually has the Library window built into the layout. If you’ve since then changed this simply click Window > Libraries to open the Creative Cloud Library. Here you can find several assets, either saved by you personally or by other in projects you’ve been invited to. Using the Library you will be able to pull up color palettes, vector files, and much more. You won't have to leave After Effects to bring in the content, which is HUGE. If you don’t have an application open you can still access files stored in your Creative Cloud Library. Simply open the desktop app, and near the top of the window click “Assets”. Files - You can access and manage files stored on your local hard drive. 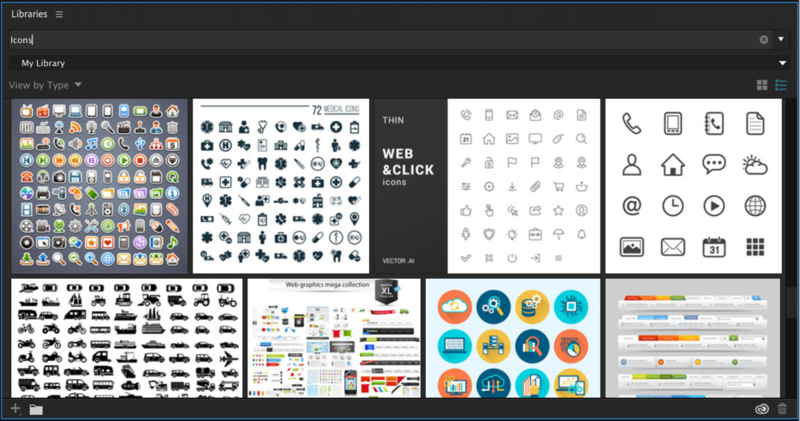 Market - Search and download vector files and various other assets from Adobe's market. Where are the local files stored? 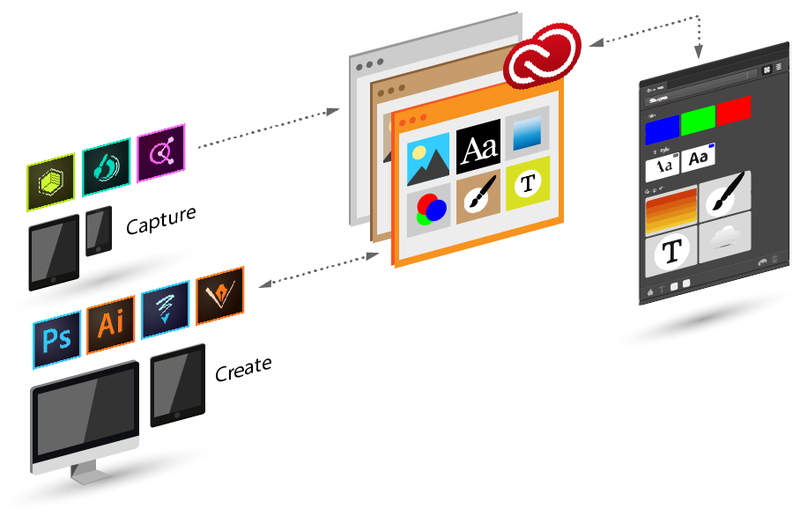 Creative Cloud Libraries is cloud based asset management, and Adobe has taken the opportunity to provide amazing cross-platform integration. Using your Adobe ID you can create artwork on phones and tablets, then sync that artwork to your Library. This allows you to open on those files on your more powerful machines. For example, if you use an iPad to create a hand drawn illustration in Adobe Illustrator Draw, you can upload that artwork to your Library. Then open it up in Illustrator on your desktop computer, make refinements, and use Overlord to send it directly into After Effects. Now first off, we don’t want to just start throwing assets into one folder, that’ll get messy. When you’re working with clients or team-members (or by yourself) it’s important to stay organized. You can create multiple libraries by simply clicking the dropdown menu from the Creative Cloud Library Window, and selecting Create New Library. When you’ve created a library and want to invite someone to collaborate simply right-click the top of the Libraries panel and select collaborate. Whether you’re a freelancer working on an in-house machine, or you just upgraded your workstation, you don’t want to spend a lot of time re-establishing your UI preferences in After Effects. With CC Libraries you can actually select UI preferences and sync them to your account. These will save to your Creative Cloud ID, allowing you to download them on new devices. So you may be asking: What After Effects preferences can I sync using Creative Cloud Libraries? Well, Here you go! The Library panel acts as a browser for your assets, and since this is created by Adobe you can get image previews for your different files. This is especially helpful if you’re working on Windows. 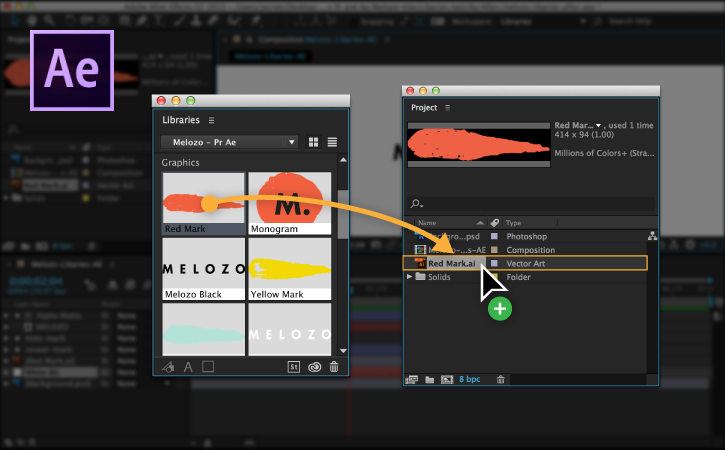 Want More Tips for Adobe Products? At School of Motion we create more original motion design content than anyone else. So if you're looking for creative resources like the best mood board tools for motion design, advice for going freelance, tips to help you stay organized, and reviews of products we have plenty of articles, tutorials, and podcasts for you. Take your animation skills to the next level. Animation Bootcamp is a great way to grow your animation skills. If you've ever wanted to learn professional animation techniques from a professional motion designer I highly recommend that you check out the course page to learn more.